Generous Partnerships Fuel the Healing Place - CARITAS - Shelter. Jobs. Recovery. Hope. Everyday at 700 Dinwiddie Avenue, hundreds of men wake up to new beginnings. They shower, they make their beds, they head to class, they work out, they sit down with peer supervisors, they write, they reflect, and so much more. These are just a few of the activities that make up their days as they learn tools to sustain their sobriety and build their futures. In between, they eat. Jackie helps prepare and serve nearly 600 meals every single day for men at The Healing Place. Food is one of many essentials we provide, including beds, showers, resources, and love, so residents can focus on the work at hand: recovery. Since The Healing Place opened, more than 8,000 men have found hope here. We offer services at no cost. We do this thanks to the generous, and often creative, support of our community partners. “It really fits an important need in our community,” says Susan Davenport, co-owner of Tazza Kitchen and The Big Kitchen, the newly launched prepared meal service. Through The Big Kitchen, Community members can pick up (and soon have delivered) freshly prepared meals. Sometimes, not all of the meals from Big Kitchen make it to a home. So, Susan and her team take a trip to The Healing Place. When men have a healthy meal, it not only fuels their bodies, but their mind and spirit, she says. Men in the program actually help Jackie prepare food every day. The experience becomes an important part of their road to recovery. For 14 years, Jackie has ensured that The Healing Place residents don’t miss a meal. “It’s important to us to support efforts in the community,” Susan says. A blend of private donations and in-kind items like food ensure that The Healing Place can welcome anyone ready to commit to a life in recovery. That includes eliminating as many barriers to our recovery services as possible, including cost. 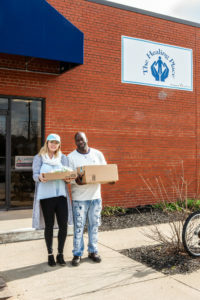 Susan and The Big Kitchen team join a list of other businesses who donate food regularly to The Healing Place: University of Richmond, Altria Theater, Christ Church, WalMart, Target and Costco. Jackie also works with community members who come in to help serve meals. Volunteers can learn more and sign up for opportunities here. Learn more about The Healing Place. Learn more about The Big Kitchen.